While I'd love to report that harmony continually reigns in my house, this isn't the case. We're a normal family. We say things we regret, get under each other's skin, fight, fume, and eventually patch the rough moments with apologies and forgiveness. I forget that this behavior is normal. After years of practice, I assume we already should have mastered lessons of good manners and conflict resolution. I secretly worry that any sign of dysfunction is terminal. When one kid does one rotten thing on a day when I already feel off, I can spiral quickly, suspecting that every parenting decision I've made up until that point—including, but not limited to, choices about my kids' diets, exercise, technology use, bedtime, activities, and disciple—has been wrong. It escalates quickly. Let's say I plan a craft to entertain my younger daughters while my husband travels, but they ruin the evening by launching into an epic fight over which canvas to paint (which is a purely hypothetical example, not something that happened last weekend.) Instead of thinking, "Well, this behavior isn't ideal," if I'm depleted and hormonal enough, in seconds it's not merely about the canvases. It's about how I've somehow failed to teach them better, or how they'll never grow up to be courteous or sane members of society. Of course, this isn't true. It's merely a storm of swirling emotions, howling my heart’s deepest concerns. In these moments, I think about the disciples as they crossed the Sea of Galilee. They saw the waves, heard the wind, and felt the boat's terrible lurching. In the presence of these alarming sensory cues, their deepest fears surfaced. The worst-case scenario finally had been confirmed: the ship was going down. They would die. Meanwhile, Jesus slept. Jesus was in the boat with them, yet he remained unaffected by the waves and wind. The storm wasn't in him. 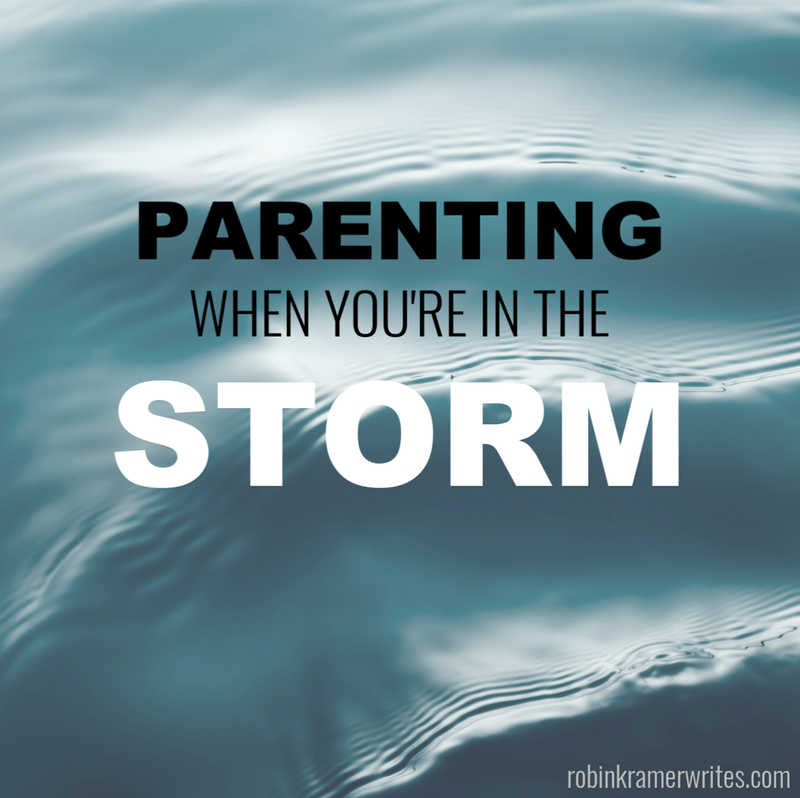 Don't we all need this ability to keep the storm "outside" of us when we parent and navigate life? When chaos laps at our feet, waves of craziness crash, or toddler tantrums and teenage eye-rolls threaten to sweep us away, we can acknowledge the storm's existence. But then, in the next breath, we still can announce, "Peace, be still." This declaration of peace not only pertains to what happens around us; it's equally important for what happens inside us. We can see external storms unfold around us: children melt down, belligerently argue with their siblings, or speak careless words of disrespect. As we watch, invisible storms, which are even darker and sometimes more damaging, rage inside us: worries that our kids are going the wrong way, concerns that they'll never internalize what we’ve taught, or suspicions that their bad behavior indicates that, somehow, as parents we've screwed up everything. Like the disciples in the Sea of Galilee, our worst-case scenario seems to be confirmed. These ships of ours? They're taking on water. They're going down. But Jesus would say, "Peace, be still." Not only to the conditions, but also to our hearts. Over the years, I've accepted that it’s not the best time to engage in deep soul-searching or emotional introspection when storms actively rage around me. Let's be honest: these aren’t the right times to entertain a new haircut, much less to critically evaluate my parenting performance or analyze my life purpose. No, when storms rage, it's simply time to ride them out and declare peace. It's enough to teach my kids that their feelings are legitimate, but new feelings will blow through soon enough. It's enough to accept that chaos is real, but it doesn't have to rule. It's enough to survive by telling my emotions, "I feel you, but you don't have the final say in how this scenario turns out. That right belongs to Jesus, and he says Peace." Storms will come; they always do. But we can keep the storms outside of us, even if we're inside of them. This is awesome...and so true! A great reminder to rest in Him when we experience the turbulence of life. You are such a great writer! Thanks for sharing! Love love LOVE this, Robin!! Will be sharing on my page this Sunday. <3 You're such a beautiful writer and I LOVE your sense of humor! Christine, I'm honored! You're scratching every conceivable itch with those kind compliments. So glad you enjoyed the post, and thanks for sharing it!